Designed to compliment the styling of your Victory! 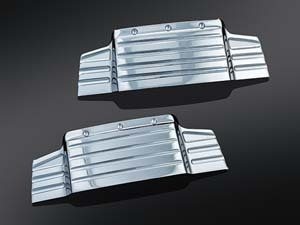 7179: Enhance the natural body lines of Victory tank with these chrome-plated ABS Tank Speed Lines. 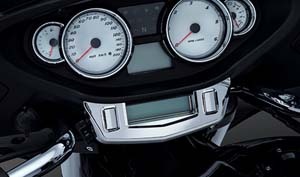 Upper and lower accents instantly add dimensional depth to both sides of the tank with effortless peel-&-stick application. Fits '10-'15 Cross Country, Cross Country Tour, Magnum, Magnum X-1, Cross Roads, & '12-'13 Hard-Ball. 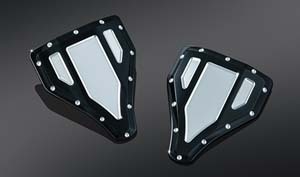 7696: Dress up the inner fairing on your Cross Country with this Chrome Switch Panel Accent. 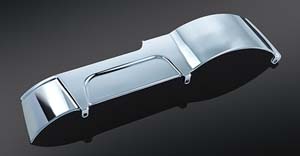 Made of chrome plated ABS and contoured to fit the OEM dash, this piece will give you instant gratification due to the easy Peel & Stick installation. 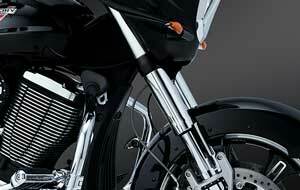 Fits: '10-'14 Victory Cross Country & Cross Country Touring Models (except 8-Ball). 7698: L.E.D. 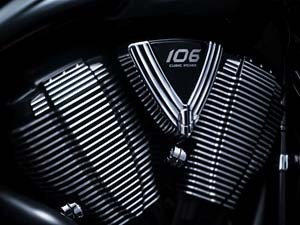 speaker grills in Chrome. 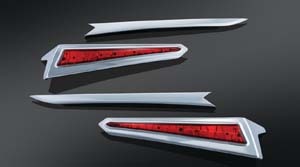 Stand out and show off your style with the latest in high tech accent lighting. Featuring integrated blue L.E.D. 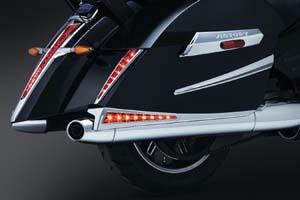 lighted ribs as a perfect match to Victory's OEM dash lighting and polished stainless mesh adding unique, quality styling. Plug-&-Play wiring makes installation a snap. 7699: Similar to above but in black. 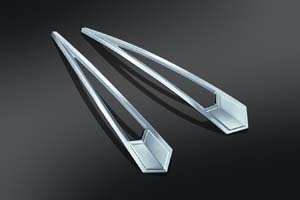 7120: Upper fork shrouds in Chrome. Add some style to your stock forks without the need to disassemble them! 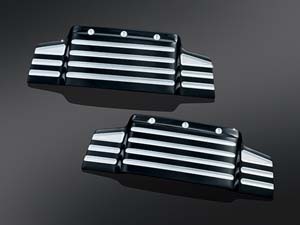 Available in either Chrome or Gloss Black these beauties will truly transform the look of your front end. 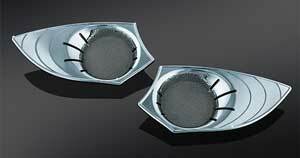 Especially when combined with Küryakyn's Lower Fork Covers. 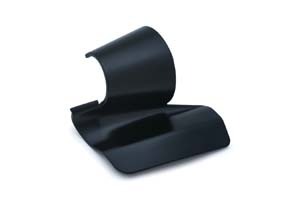 Peel-and-stick installation provides easy removal and re-installation if necessary. Fits: All '10-'14 Victory Cross Country & Tour Models, '10-'14 Cross Roads Models and '12-'13 Hard-Ball Models. 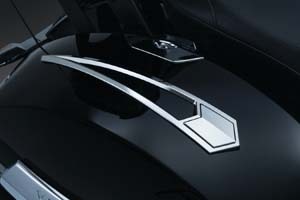 7121: Similar to above but in gloss black. 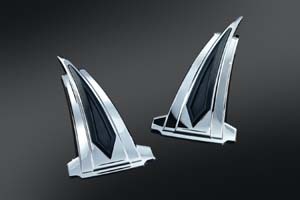 7125: Black anodized and machined to perfection for a style unlike any other. High-quality and precision fit accessories that bolt-on with ease in just minutes. Non-conventional design will set your bike apart from all the rest. Installation is simple with VHB Adhesive. Just peel-clean-stick! Fits: All '10 - current Victory Cross Country, Cross Country Tour, Cross Roads & Hard-Ball Models. 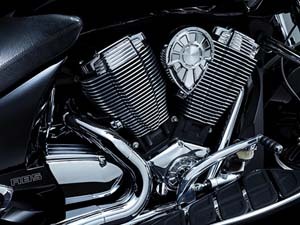 7189: Spark Plug Fillers for Victory are made from quality black powder-coated die-cast aluminum with polished outer edges to create the appearance of completely finned jugs on Victory 100 and 106-inch engines. 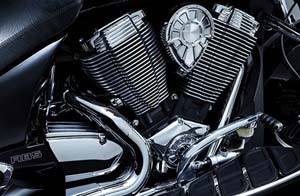 A unique single-screw install fills the void around the spark plugs and coordinates with the outer polished aluminum edge of the motor. 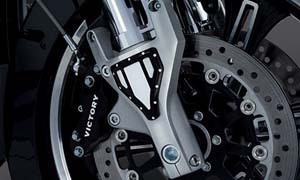 Fits all '06-'15 Victory Models with 100 & 106 Inch Motors, & '05 Hammer Models with 100 Inch Motors. 7624: You can never have enough chrome! This one piece contoured cover is designed to bolt directly to the outer primary cover and add the perfect amount of style. Transform your inner primary in minutes with no need to remove the outer cover. Fits: All '99-'14 Victory Models (except Vision). 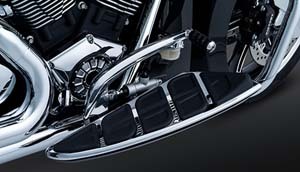 7635: Designed to compliment the fin design on the Victory Cylinder's, these unique Valve Cover Accents install in seconds without the need to disassemble the motor. Available in Chrome. 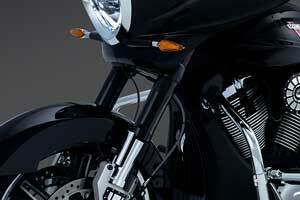 Fits: All '06-'14 Victory Models with 100 and 106 inch motors and '05 Hammer Models with 100 inch motors. 7636: Similar to 7635 above, but in Tuxedo. 7626: Cover those unsightly wiring and tubes while adding some style and shine! 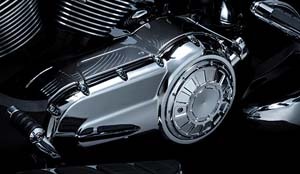 This stamped metal chrome cover will provide the perfect amount of style and shine while doing double duty to hide the necessary wiring and tubing that bring your bike to life. 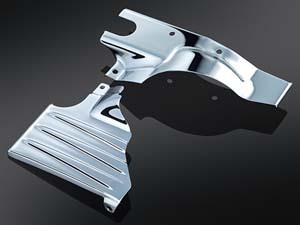 Looks great either by itself or with our Chrome Inner Primary Cover. Bolt-on in minutes. Fits: All '10-'14 Victory Cross Country & Tour, Cross Road & Hard-Ball Models. 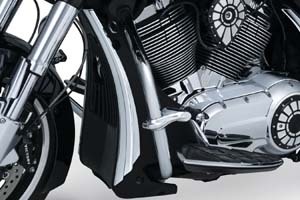 7129: Chrome Radiator Shroud Accents for Victory baggers are an easy and effective way to enhance the dull black plastic radiator shroud casting. 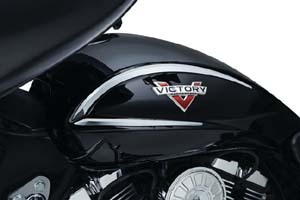 Durable chrome-plated ABS featuring a stepped pattern that coordinates with our Windshield Trim (P/N 7693), Windshield Center Accent (P/N 7694), Fairing Eyebrows (P/N 7691) and other trim accents for Victory. 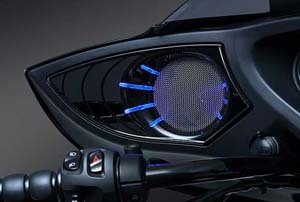 Creates an elegant appearance to the front downtubes. Easy to install with high-strength 3M VHB adhesive. Measures 20.5” long x 3” wide. Fits '10-'16 Cross Country, Cross Country Tour & Magnum Models, '10-'14 Cross Roads Models, & '12-'13 Hard-Ball. 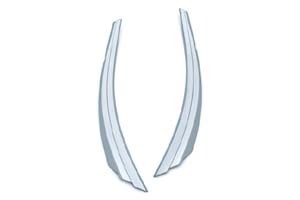 7279: Sabertooth L.E.D. Saddlebag Accents (pr). Bring some bite to your bike! 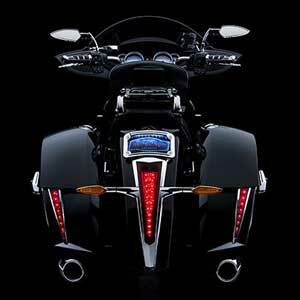 Designed to compliment the body lines of the OEM saddlebags and coordinate with the main taillight, these stylish accents function as additional run-brake rear lighting. Peel-and-stick with plug-and-play wiring make installation simple. Fits: '10-'14 Victory Cross Country, Cross Country Tour and Hard-Ball Models. 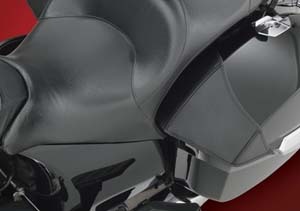 7692: Prevent those unsightly saddlebag scuffs and scratches or cover up ones that are already there. Not only do these offer protection, but they also look great by offering just the right amount of contrast with black rubber inlayed with brilliant chrome. Installation is hassle free, just peel-&-stick. Fits '10-'15 Cross Country, Cross Country Tour & Magnum Models, '12-'13 Hard Ball, & '10-'14 Cross Roads Models with Hard Bags. 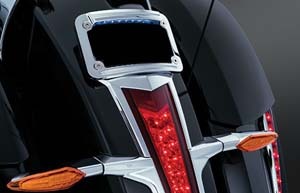 7695: These elegant accents attach down the top center of the saddlebags to flawlessly enhance the bike's contours. Mount either directly centered on top of the saddlebags, or slightly to the rear and coordinate with our Saddlebag Front Kick Accents, P/N 7692 sold separately. Features simple peel-&-stick installation. Fits '10-'15 Victory Cross Country, Cross Country Tour & Magnum Models, '12-'13 Hard-Ball & '10-'14 Cross Roads with OEM Hard Bags. 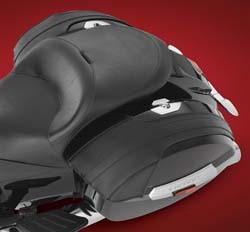 7174: Designed to enhance the existing body line, these will dress up your Victory saddlebags and provide some scuff protection at the same time. Easy peel-&-stick installation. Fits '10-'15 Cross Country, Cross Country Tour & Magnum Models, '12-'13 Hard-Ball, '10-'14 Cross Roads Models With Hard Saddlebags. 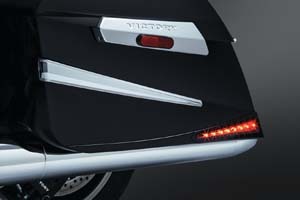 7687: The stock trim around the sides of the Victory taillight is a nice touch, now you can finish off the look with this Taillight Top Trim. Chrome Plated ABS plastic and peel-&-stick installation make this a "must have" for any Cross Country, Cross Roads or Hard Ball. Fits: All '10-'14 Victory Cross Country, Cross Country Tour, Cross Roads & '12-'13 Hardball Models. Shown with L.E.D. 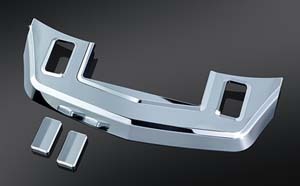 Laydown Curved License Plate P/N 7688 seen on our License Plate Products Page. 7618: Keep your feet comfortable for the long haul! Featuring a raised front toe kick to provide that extra level of comfort needed for those long days in the saddle and unique styling designed to set your Victory apart. 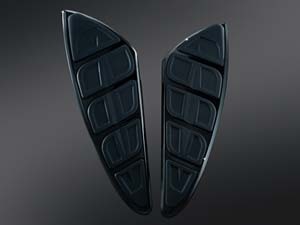 Direct replacement for OEM floorboard inserts. Fits: All '10-'14 Victory Cross Country & Tour Models, '10-'14 Cross Roads Models & '12-'13 Hard-Ball Models. 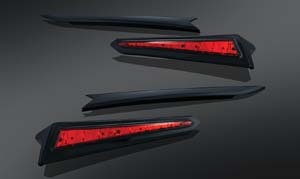 7619: Similar to above but in Gloss Black. 7170: Create a low, mean tail-dragger look at an affordable price with easy plug-&-play installation that requires no drilling. 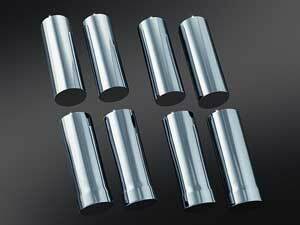 Two-piece design installs with stock exhaust, or any aftermarket exhaust with matching or smaller diameter. 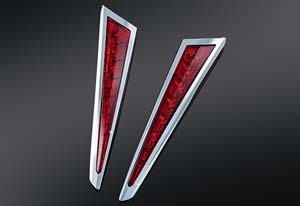 ABS plastic available in chrome with red lenses and L.E.D. running lights. Fits '10-'15 Victory Cross Country, Cross Country Tour & Magnum Models, '12-'13 Hard-Ball, '10-'14 Cross Roads Models With Hard Saddlebags. 7171: Similar to above but in Black. SLB-103: eG now has an attractive and functional pair of Saddlebag Lid Bras for the Victory Cross Country and Cross Road models. 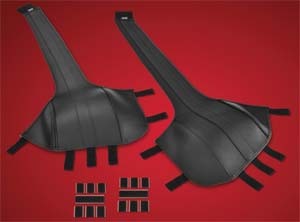 Saddlebag Lid Bras stop scratchesand cover those that are already there. 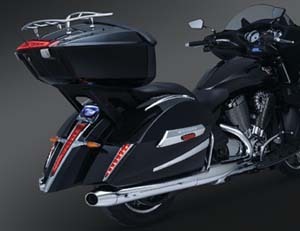 The Black Classic Lid Bra Set fits the 2010 to current Victory Cross Country and Cross Road hard saddlebags. 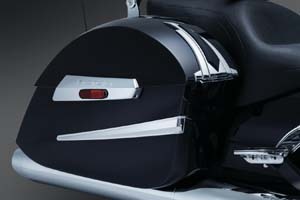 A tapered design leaves the saddlebag lids artfully exposed while protecting and covering thefront portion from marring. 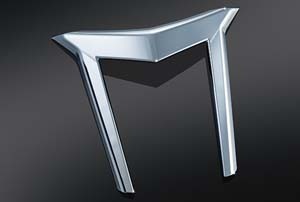 Secured in place with hook and loop to the inside top of the saddlebag lid in four locations for a secure fit. Removes easily for cleaning and waxing. For Victory Cross Roads, Cross Country. 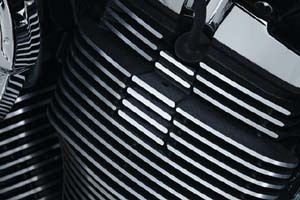 LC-V08: A scaled down Victory Saddlebag Lid bra to a mini version. 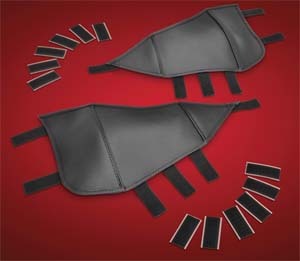 Saddlebag Lid Bras help stop scratches to your saddlebag lid or cover those that may already be there. 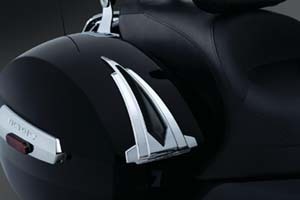 The mini tapered design leaves thesaddlebag lid artfully exposed while protecting and covering the front edge from scratches. Secured in place with strategically placed hook and loop fasteners to the inside saddlebag lid. Easily removes for cleaning and waxing. 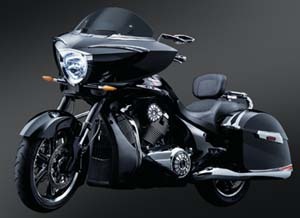 Designed to fit Victory Cross Country and Cross Roads models. Made in the USA. Black. 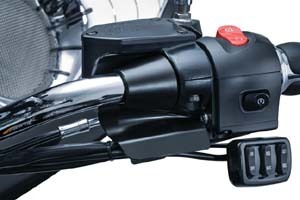 5660: Instant gratification every time you mount your steed by cleaning up the right-side control housing, mounting bracket and wiring with this trick little Handlebar Control Bracket Cover for Victory models. Satin black finish provides a clean appearance to match the factory control housing. Made from durable, lightweight injection-molded ABS. Easy to install via high-strength 3M VHB adhesive and single-screw mounting clamp. Fits '10 - '16 Victory Cross Country, Cross Country Tour & Magnum Models, '12-'13 Hard-Ball & '10-'14 Cross Roads with Stock 1" Handlebars.